Already own a home in the Woodlands at Malbis subdivision? Thinking of selling? Click here and read about current search trends & our web network. 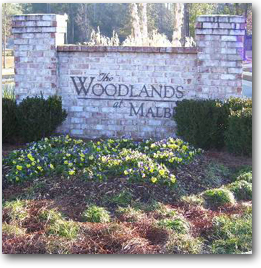 The Woodlands at Malbis is a premier, upscale neighborhood located off Highway 181 in Daphne. It offers estate-sized lots and the homes range from 3,000-5,000 square feet. The Woodlands at Malbis is a gorgeous upscale small intimate neighborhood with large estate lots. The neighborhood is one of the more secluded subdivisions in the area, yet close to various routes that make travel to many of the area's attractions and neighboring cities a breeze. The Woodlands at Malbis also features has fabulous tree-lined streets and includes several lakes and truly is a hidden gem in the area....maybe not quite hidden, but definitely secluded and private. The Woodlands at Malbis is ideally located close to the interstate as well as a lot of shopping and dining. If you would like to schedule a private viewing, need more info or have questions concerning the Woodlands at Malbis or any other property, please email info@condoinvestment.com or call 251.Area.Pro (251-273-2776) for immediate assistance.